In India, 72 % of the farmers hold less than 2 ha of land, out of which approximately two-third has less than 0.5 ha of land, based on the latest available agriculture census (see Figure 1). With more than a lakh farmers falling in this category, the regular maintenance of the farm records (farming type, type of crop, health of the crop, water stress, etc.) is a humongous task. While agriculture is influenced by factors varying from farm to farm and requires information tailored to the local scale1. Due to the lack of proper data, the unit of the various government schemes is not an individual farmer, but rather a larger administrative unit (e.g. a village, panchayat, taluka, tehsil, district, etc.). Once such large scheme is crop insurance (Pradhan Mantri Fasal Bima Yojna(PMFBY)) which aims to provide protection to farmer against losses caused by crop failure and thereby ensuring stability in farm income2. Due to the tedious effort required in collecting the data at the farm scale, the crop insurance is implemented using the homogeneous area approach. However, the cause of crop failure varies from farm to farm and a significant variation is observed within a village. A possible solution to collect the data at farm scale is the satellite remote sensing. The availability of higher resolution satellite in microwave bands which are capable of penetrating clouds makes it possible to collect the data at farm scale in all weather conditions. 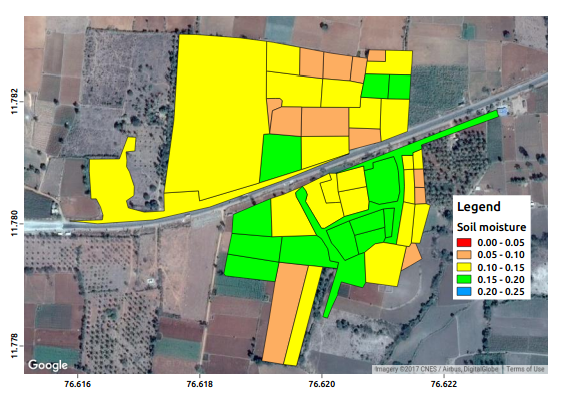 As an example, the active microwave (RADARSAT-2) estimated soil moisture for the farms in Chamarajnagar district of Karnataka, India is shown in the above figure. The satellite estimated soil moisture was validated using the 1262 data points spanning over 4 years in 50 farms3. During the validation, the mean Root Mean Squared Error was observed to be around 0.04–0.06 m3/m3 indicating the good retrieval of soil moisture from satellite data at the farm scale.